FMP Models are obsolete and are no longer available, however modern replacements are available. These are plastic encased (not encapsulated) 3- and 10-Watt single output a-c to d-c flyback voltage stabilizers, producing 5V, 12V, 15V, or 24V. FMP are designed for the North American market. They operate from 115V a-c nominal. NOTE: FMP are not recommended for new designs. Availability is limited to factory stock. 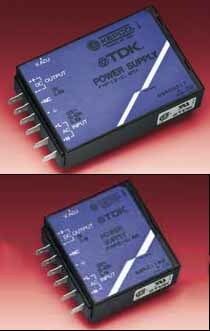 a-c input 85-132V; d-c input 110-170V Note: Safety approval for FMP applies to a-c operation only. Voltage limited by zener diode across output. Rectangular current limiting so you can drive nonlinear loads. Holding time: Output is sustained by internally stored energy for 30 milliseconds typically, 20 milliseconds minimum. Built-in EMI filter: Attenuates conducted noise below the requirements of FCC Class B. Low profile: Only 3/4" thick. Safety: All models recognized by UL, certified by CSA. FMP 5-2K is available in a PC Board mount version (FMP 5-2BK).